A civilized man is, therefore, expected to give all protection to the bulls and cows. But, today, people are becoming more and more uncivilized by neglecting such instructions and they are encouraging cow killing. In Rig Veda (9.46.4) it is said: gobhih prinita matsaram: one who is desirous of killing the cow is in the grossest ignorance. Instead of killing the cow and eating its flesh, civilized men must subsist on various milk and agricultural products. gavah panca pavitrani: the cows deliver five products and all of them are pure and uncontaminated. The five products received from the cow are milk, ghee, yogurt, cow dung and urine. These five products, called pancha-gavya, are required in all ritualistic ceremonies performed according to the Vedic instructions. Cow’s milk is considered the most miraculous food which helps in developing the finer tissues of the brain that helps in understanding the higher purposes of life. It helps one understand the intricacies of transcendental knowledge. Milk can be transformed into yogurt, curd, butter, ghee and by combining the milk and milk products with grains; hundreds of palatable dishes can be prepared. The ghee or clarified butter is used not only for preparing delicacies but also for the sacrificial performances. A patient who is suffering from a disorder of the bowels due to overindulgence in milk products is cured by another milk product, namely curds. Even the urine and stool of cows have medicinal value. Cow dung contains all antiseptic properties and is considered a purifying agent. Cow dung can also be dried and used as fuel. The cow urine and dung are used even for bathing the deities. ISKCON Bangalore started a goshala in the year 1986, with one cow named Vasundhara, and her calf Tamala. Since then, over the last 30 years, the herd has increased. 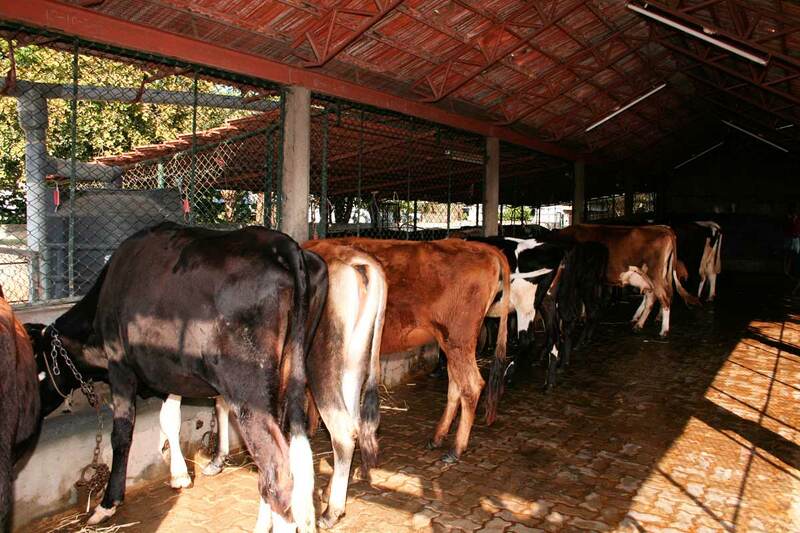 Currently there are 25 cows, housed in a facility behind the temple complex, which is kept immaculately clean by a team of three trained dairymen. The cows are bathed every day and during the summer they are bathed twice. They are allowed to roam around freely in a corral so that they can stretch their limbs and get some exercise. The milk from these cows is offered to the Lord not only as it is, but also used in a variety of forms to prepare delicious offerings. Many visitors have commented that the cows on Hare Krishna Hill are peaceful and content. 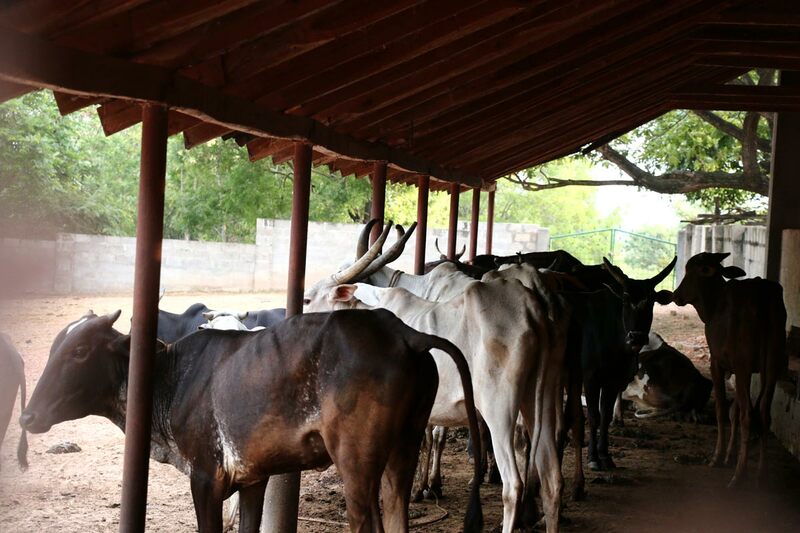 As the cows age, when they are unable to give milk, they are moved to ISKCON Bangalore’s farm at Mahadevapura in Mandya district where they peacefully spend the rest of their lives, grazing on the fresh grass and the sweet hay that is readily available there. The young bulls are also moved to the farm. There, these energetic animals are trained to plough the fields and carry loads to help in farming activities. In Brihat Parashara Smriti (5.26-27) it is said that one who feeds the cow with grass and water every day derives the benefit equivalent to performing Ashwamedha Yajna. Those interested in contributing towards the feeding of cows CLICK HERE. 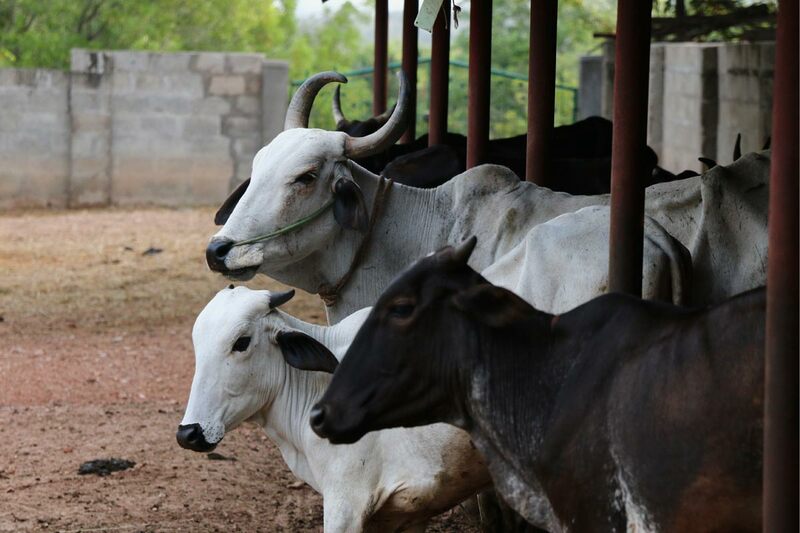 You can also sponsor the maintenance of the cows in the Goshala in Bengaluru as well as the retired cows and bulls at the Hare Krishna Farm at Mahadevapura. Hare Krishna Hill, Chord Road, Bangalore-10 Karnataka, India.